This activity can be used in class, at a club meeting, or as a booth activity in a community fair or expo. Flooding is a problem in all parts of Louisiana. This activity may be particularly useful when students have witnessed a flood, but it well be fund and leave useful impressions even if they have NOT had that experience. Preschool and elementary students will discover through hands-on play that it’s hard to keep water on one side of a barrier, but having the floor of the house off the ground almost always keeps it dry. Middle and high schools students will reach similar conclusions, through experimentation and more deliberate attempts to make leak-proof barriers. Having completed the exercise, older youth will be equipped to offer the activity to students in lower grades. The 2015 4-H A-Team, with members from eleven parishes, developed a plan to keep floodwater out of the Grant-Walker amphitheater. Louisiana 4-H'ers are finding their voice in making their communities safer from disaster. Through four special projects over three years they had fun leaning to protect themselves, their families and their communities from floods and high winds. They learned to adapt buildings -- homes and offices -- so they are more resistant to storm damage. They assessed buildings for vulnerability to storm damage and created a report of ways to reduce that vulnerability. They visited local government officials, learning about building permits, ordinances, financing and other things relevant to growing hazard resilient communities. Parish teams in Vermilion, St. John the Baptist and Jefferson Davis measured their distance of from the coast - horizontally (in miles) and vertically (in feet). They planted a permanent marker with a known elevation that can be monitored over the years to see if the ground is rising or sinking. Those markers, being in public places, can start conversations about flood and hurricane risk among future generations of students, teachers and parents. Each team wrote grant funding proposals for projects to protect local publicly-owned facilities, and presented those proposals to local authorities. Each team produced "teach back" programs (video, poster, post cards, public service announcements) to share what they had learned. * The "A" in A-Team is for "Adaptation", which is another word for "mitigation". This guide introduces students to the types of flooding, the effects of flooding and methods of preventing flood damage. The activity includes using the LSU AgCenter FloodMaps portal service to make site-specific flood zone determinations by looking up addresses or simply clicking on the map. Familiarity with the FloodMaps portal provides a skill that can be used to serve the community residents and local floodplain officials in floodplain and flood insurance education. The Guide also serves as background for youth leaders and teachers interested in the Flood Fighter Challenge table-top activity. 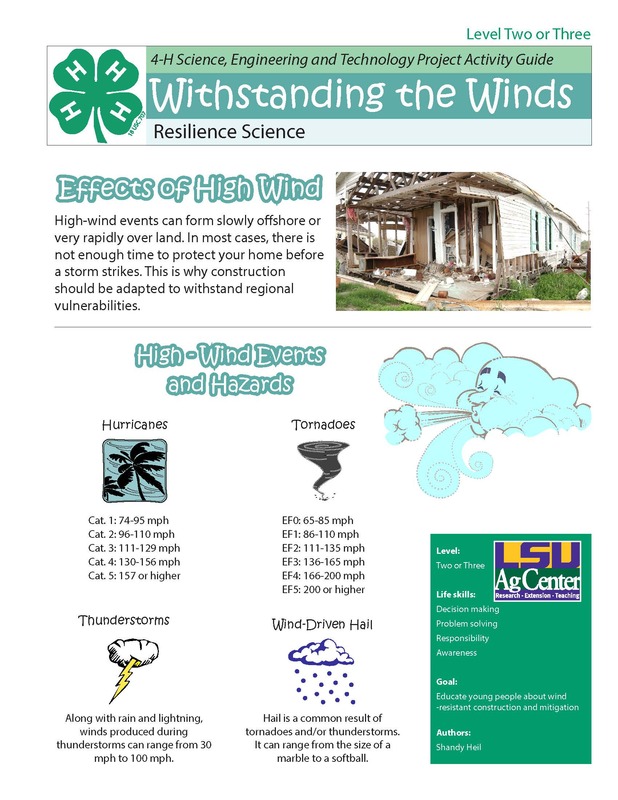 This guide introduces students to the types of high-wind events hazards, the effects of high winds on homes, and methods of preventing wind damage. The activity includes using the Windspeed and Elevation service to determine ground elevation and wind-resistance design requirement of the Louisiana building codes by looking up addresses or simply clicking on the map. Jefferson Davis 4-H A-Team planned a wind and rain proofing project for the school board building during a one-week summer camp. Vermilion Parish formed the first A-Team. This is the story of what they learned, the mitigation project they proposed, and some of their accomplishments and adventures. 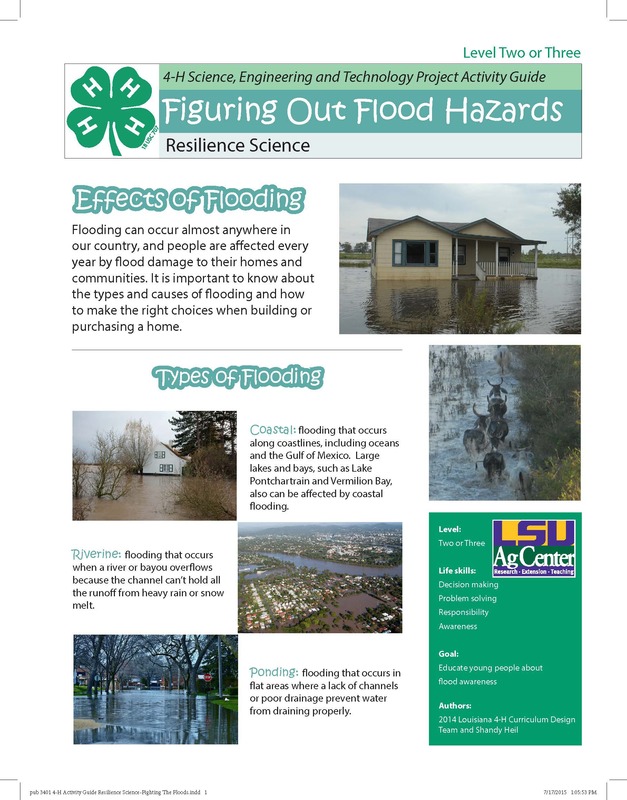 The LSU AgCenter is introducing hazard mitigation planning as an opportunity in the 4-H Youth Development program. St. John the Baptist Freshman Success Academy designs safe rooom for pairish emergency operations center. In this table-top, hands-on activity children will become aware of the importance of elevation to prevent flood damage. Photos from Vermilion 4-H Youth Mitigation project.